You May Be Pre-Approved! Check It Out Here! For anyone looking for a new truck, the Jeep Gladiator is a unique offering that we have at Village Dodge. It's the only open-air pickup on the market, meaning that you'll certainly garner a lot of positive attention when you drive it around town. To get the air flowing through the truck, the top can be opened up whether it's a hard or soft top. Further, the doors can be removed, and the windshield can be folded down. This gives people riding in the Gladiator the classic Jeep experience. 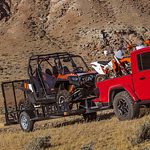 With best-in-class payload and towing, the truck is quite capable. It can haul your gear, whether professional or personal, no matter where you're heading. Regardless of the trim you select, you'll get a truck with heavy-duty front and rear axles and a 4x4 system. More hard-core off-road gear such as wide track axles that can lock, FOX shocks, and a TrailCam Off-Road Camera are available as well.